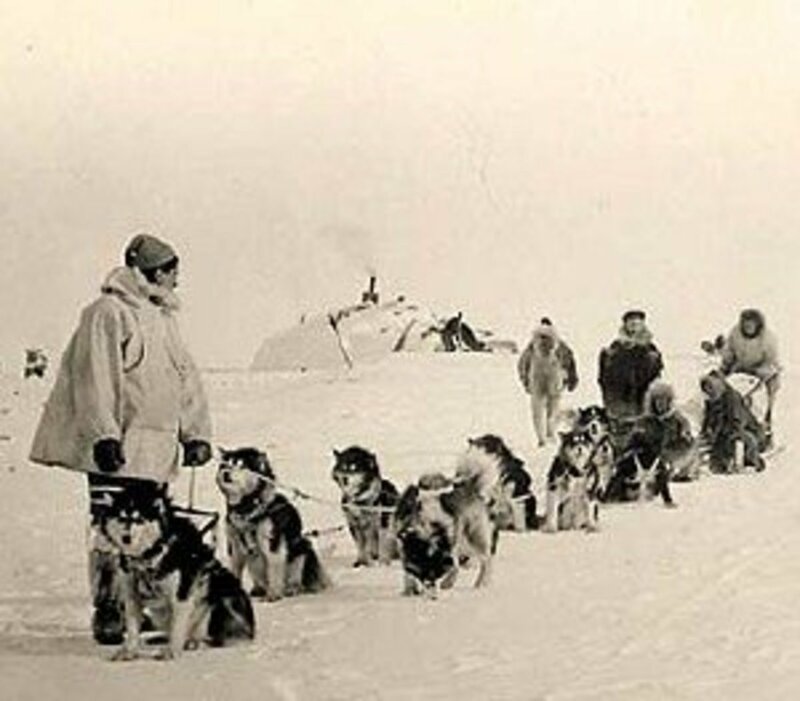 Long before we had heard the words eco-friendly, my family was already traveling in the Arctic in the time-honored and traditional way - by dog sled. My parents, explorers at heart I'm sure, had barely whet their appetites for the local culture during my father's first posting to Aklavik. By our second tour in the High Arctic a few short years later, our parents jumped in to the local "scene" with both feet. I'm sure they mildly scandalized many of the military clan by "mingling with the locals", but attending drum-dances, and spending our school holidays up-river in a trappers cabin was great fun. Our father befriended one of the locals - a trapper by trade - and with the acquisition of our first Husky pup, a female Samoyed/wolf cross, we were well on our way to growing our own sled-dog team. Once she was old enough, Cricket, who had grown into a sleek-coated, pure white speed-demon, was bred to a beautiful male. Raised by two teachers who couldn't take him south with them when they left, Biscuit had been "returned to the fold". The trapper said he would never be much as a sled dog, but he sure made good pups. Welcome to Snowy Owl Sled Dog Tours! Sure enough, in due time we were presented with four furry wonders. Dad and the trapper promptly named the foursome Acey, Deucey, Trey, and Little Joe - a good poker hand, they said. Acey, the first born was a rough and tumble character from birth - a beautiful black and white pup with the characteristic over-eye spots of a husky, and the long fluffy coat of his Samoyed forebears. Deucey was a fine-boned, gentle spirit who should have been a house pet. He was a pure white version of Acey. Trey was white and smooth-haired like his mother. Big-boned and good-natured, he was huge, all sled-dog and loved to pull right from the git-go. Little Joe was the smallest of the "hand". Brown and white like his sire, he too sported the white over-eye spots and extra-long Samoyed coat. Whatever he lacked in size, he more than made up with in spirit - always the first into the fray, and the last back down from a good tussle. As the pups grew old enough to pull weight and be trained as sled dogs, we would sometimes hitch a couple to our toboggan and give our baby sister a ride. We were only allowed to do this under the careful supervision of our dad and the trapper, especially after the first time. I am quite sure they feared for our sister's life if we were left unsupervised with the enthusiastic but untrained pups. I want to pull! NOW! Eastern Arctic hitch - the fan shaped array of dogs is made possible by the lack of trees. This is the command to start moving or to go faster. 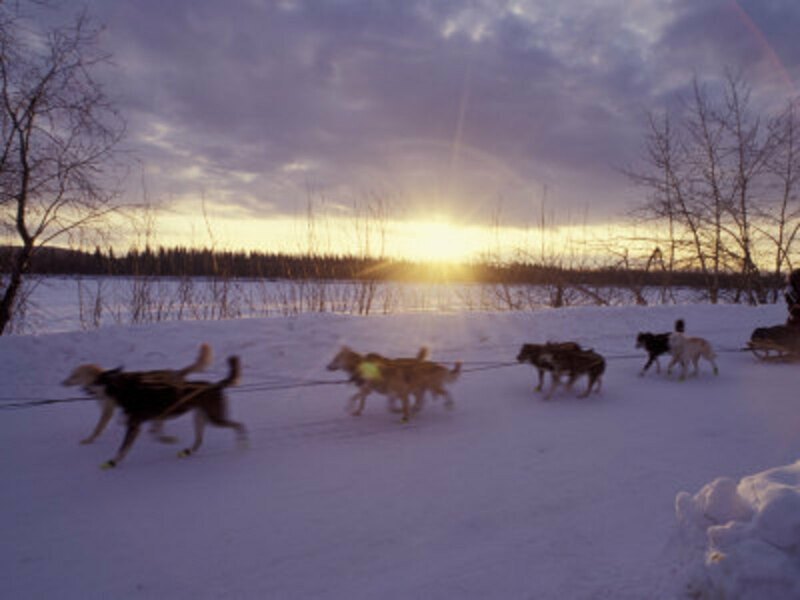 Some mushers also simply say "Okay, Let's Go!" or "All Right!," but Mush! rarely used except in the movies. They are so right in that - our trapper was a fan of the simple "Hup!" or "HUP, you dogs! Hup!" bellowed in stentorian tones if the team didn't seem to be paying attention. The command that the dogs never really listen to. This means stop. Usually, the brakes must be applied to attain the desired result. Too true, too true! ( pronounced like the letter of the alphabet) This is the command for turning or moving right. This is the command for turning or moving left. Exactly what it implies. Used at intersections or when passing other dog teams or snowmobiles. Our trapper generally used "Go straight, straight - hup, hup, hup!" Or if he would be passing an unknown team or a team his dogs didn't like, he would simply halt his team until the others had passed. It was considered simple good manners and common sense to stop your team when faced with the approach of an unfamiliar team. Also whenever passing another team, good sense and etiquette required you to pass (or stop your team) to the left, so the oncoming team would always pass you on the driver's right-hand side - the driver's whip-hand side - in case of any trouble. Go a little slower, please. Seems to imply "Yes" to most sled dogs." The second last of the photos above features a fan-hitched team. The dog closest to the front of the frame on the lower left side is the lead dog, shown here on a tether. Often, while running his trap-line, our trapper would leave his lead dog loose. King, a huge and savvy white Samoyed, ruled his team with an even temper and formidable fangs that he used as required to enforce order. 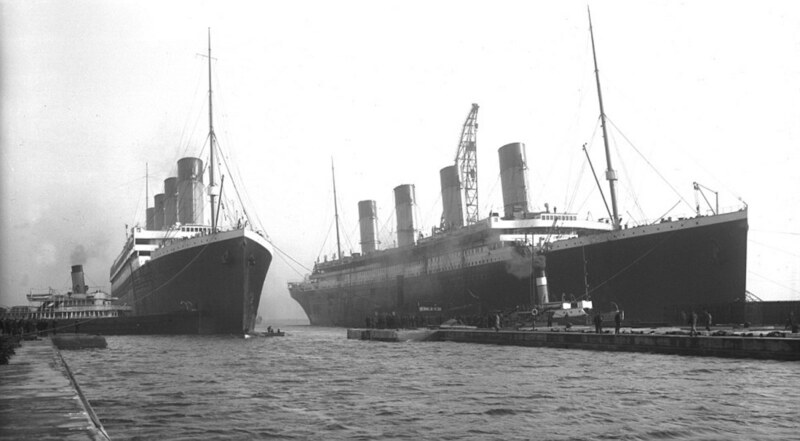 His mate, Queenie, another pure-bred Samoyed, was usually the second, or pivot dog. When the trapper was training new dogs, though, she became one of his wheel dog. New dogs were most often brought into the team in the third slot, just ahead of the wheel dogs. The wheel dogs, usually the workhorses of the team, were only second to the lead dog in terms of experience and know-how, and Queenie had no equal in training a new dog. Huskies have a love of running and a desire to pull bred in their bones. New dogs, though, have to learn how to work as one of the team. New dogs will sometimes tire of running, foul their traces, or try to slack off. Harnessing the "newbie" in the third slot, just in front of a savvy wheel dog like Queenie meant that any slacking, freelancing, or failure to lean their full weight into the traces was met with swift retribution. It usually only took a few savage nips to the miscreant's heels to bring them in line, and if the rest of the team took exception to a slacker, they would quickly "tune in" the newcomer. Raven's Watch offers a line of serviceable equipment for the active and working pet: sled dogs, working dogs and packing dogs, including - collars, leashes and leads, harnesses, backpacks, plus Siberian Huskies for sale. AKKO Sports has Dog Sled Harnesses for Sale, Traditional Dog Sledding Harness for Sale, Sled Dog Harnesses, Sled Dog Harnesses for Sale. Some of my happiest memories of our stay in Aklavik involves the many school holidays we spent at the "rat camp" - the trapper's hunting cabin. As his trap-lines were many miles from town, the cabin functioned in the same way as the range rider's line-shack. Offering shelter and supplies, it allowed the rider to patrol his territory for a longer time than if he had to return home every night. So, too, the trapper's cabin gave him a base of operations convenient to his trap-lines, where he could house his team, and patrol his trap-line. We were privileged to be able to share some amazing adventures with our "adopted family". My sister and I were members of the Junior Choir, at the cathedral where Jojo and Peewee, the trapper's two sons, served as altar boys. I don't recall Peewee's proper name after all these years, if, indeed, I ever knew it, but Jojo had been named for his father and much preferred his nickname to being referred to as "Joseph Junior". I don't recall his daughters. They were much younger, and, anyway, mostly stayed in town with their mother and grandmother who were busily teaching them "girl things", such as sewing, embroidery, and cooking. "Cooking" also entailed skinning, gutting, cleaning, plucking and any other preparation required to make "dinner" ready for the cook-pot. My sister and I were very happy to be allowed to "run with the boys". Unlike the sleek aerodynamic racing sleds of today, the trapper we knew used a wooden komatik with a heavy-duty canvas cover. It was a work sledge, meant to haul furs and supplies. 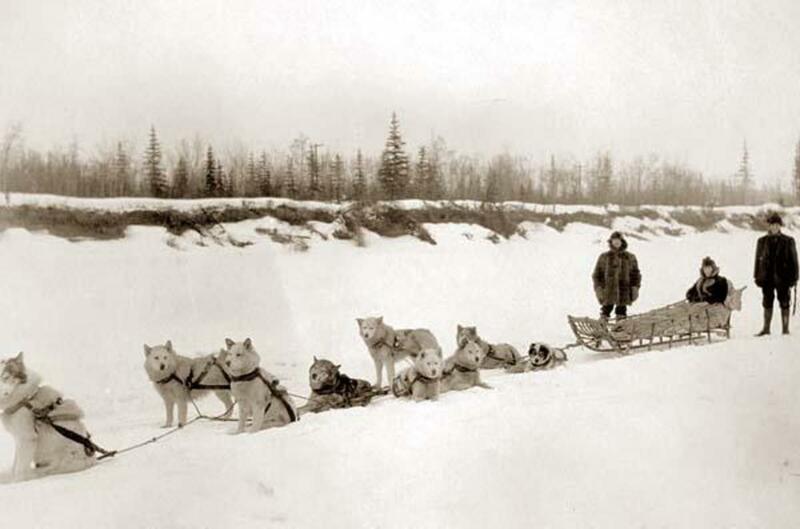 The runners in the back were long and sturdy, made to carry a man's weight, but limber enough to flex over uneven terrain, or when the driver leaned hard on one or the other to help guide the sled. Attached firmly to the back upright, a heavy rope with large knots along its length streamed out almost twenty feet behind the sled. When we asked if the trapper wasn't worried that it might snag on a dead-fall or a tree stump, the trapper replied that he'd rather risk catching a tree than losing his team. My sister and I had occasion to see that in action while returning from a short run up the river. We had enjoyed a great run, still excited from taking turns standing on the runners between the sled and the trapper while we whizzed along the hard-pack. We had just finished our tea and put out the fire. I had been returned to my seat in the sled while the trapper and my sister gathered up our tea-things. No sooner had they been placed in the sled when for some reason, the dogs decided we were ready to leave. The trapper made a mighty leap for the trailing rope as the team sprang into a dead run, only to miss it by scant inches. I still remember the fear and exhilaration of jouncing across the hard-pack towed by the runaways, hearing the trapper and my sister alternately screaming at the dogs to "whoa" and at me to dump the sled as they pounded along after us. I wasn't at all sure I could dump the heavy sledge, and I really wasn't looking forward to being dragged along behind the team if it didn't stop them. Just as I had nerved myself to heave the heavy sledge onto its side, the dogs stopped and lay down in their tracks, as inexplicably as they had started their mad dash. The trapper and my sister came panting up in short order. After he made sure I was alright, he checked the dogs to make sure they hadn't fouled their traces or injured themselves. I know he would have liked to say more, but he was aware of little ears, so he restricted himself to muttering pungently in his French-Metis patois. Certainly not all of our outings with the team were such exciting adventures, but I have never forgotten that particular one. Most dog sled tours are not so blessed. Thanks so much for stopping by and commenting, billips! We really enjoyed mushing with our little team - those dogs just love to pull. 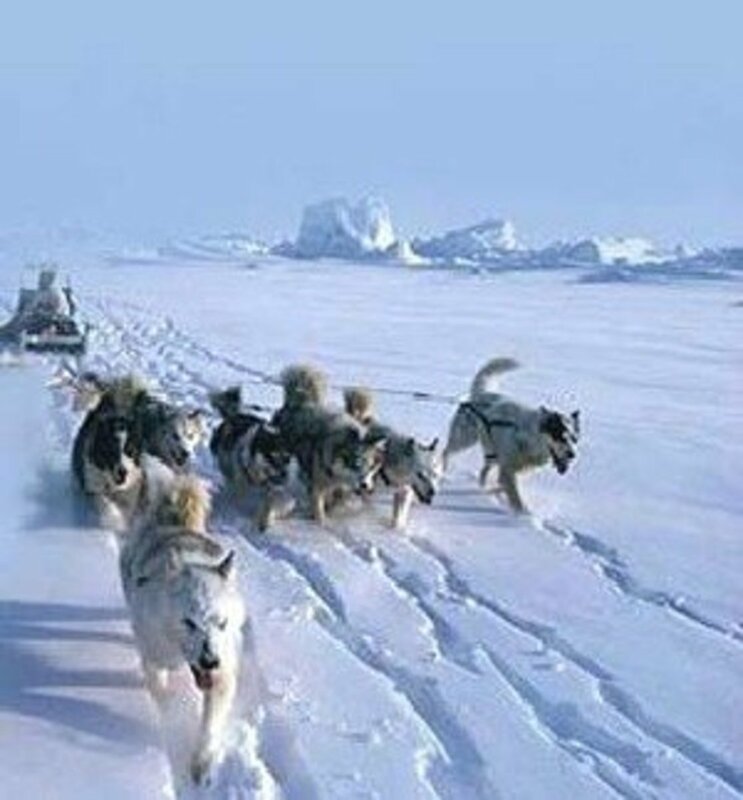 Very interesting hub - it must be an incredible experience to travel by dog sled - I so admire the strength and endurance of those wonderful dogs - regards, B. You are most welcome, puertoricoplace. I am glad you enjoyed the hub. We loved our little dog team. Nice! Loved the experience with dog sledding...it is awesome, and the dogs love it! Thanks for sharing. Thanks for stopping by to comment, Matti - I have included your remarks below without your link. 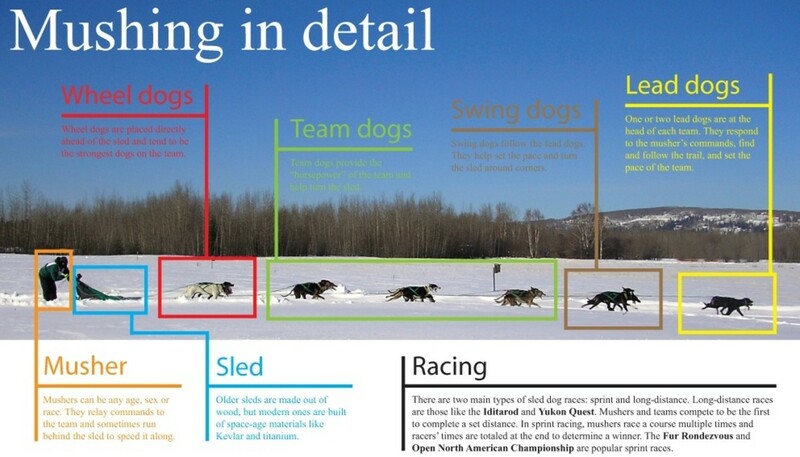 Good summary about dog sledding!!! Jaynie2000, nice to see you again. Glad you enjoyed the pictures - it was great fun tracking them down. Unique hub topic. 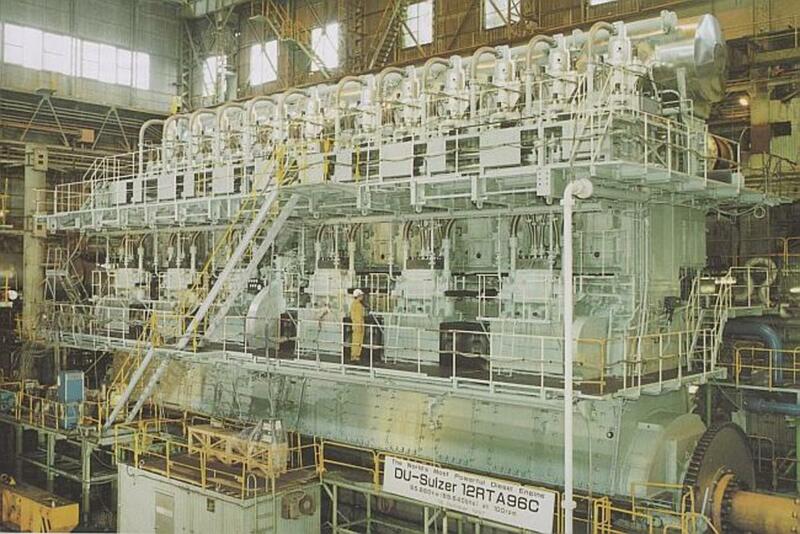 Very informative and great pictures. Loved it. Thanks! Not at all, Enelle - that's great! Always appreciate a backlink! Hi RedElf - I posted a link to your hub on my blog Dog Tails - A Wagging Good Time on blogspot.com - hope you don't mind, but it was too good not to share! Greetings, Nathan! Thanks for your comments. I am glad you enjoyed the hub! What a neat adventure. It's a great mix of animals and humans coming together. I really enjoyed reading this. Thanks! Thanks so much, Ben. So glad you liked it. Extraordinary Redelf, really amazing pictures coupled with a personal anecdote. What an amazing adventure! Hitch that puppy to a sleigh and you're three-quarters of the way there ;) It's a fabulous ride, Princessa. I know you'd have a ball! 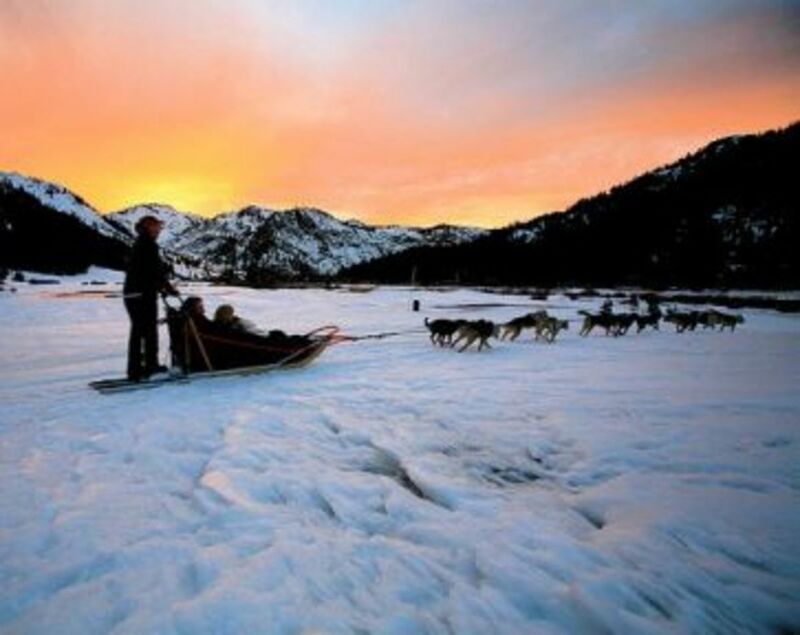 What a wonderful and amazing experience, I have seen dog sledding in films but it doesn't compare to your account. I want to go dog sledding too. I think my labrador was a Husky in his previous life, he has that trait for pulling and the strength of an elefant! They are even more amazing in person, aquaseaCreative! So glad you enjoyed them! Thanks so much, Beth100. So glad you enjoyed the hub - I look forward to reading yours! You beat me to the punch on this hub! I finished mine two weeks ago on dog sledding, but haven't hit the publish button. :) This is a fantastic hub...I love your photos and your personal experience. Thank you for sharing your adventure! Thanks so much - they are great photos. I only wish I had more family pictures of our time up there. Hello again RedElf - meant to say (when I commented earlier) that I think these photos are amazing. Well done. Very few things in this life beat having your own dog team, ethel! They are great creatures! Wonderful dogs. I had the pleasure of meeting some at a dog meeting. Thanks dohn121! The Arctic is an amazingly beautiful place! You are most welcome! Ever since I read "Call of the Wild," "White Fang," and "To Build a Fire" by Jack London, I've always wanted to go to Alaska to experience life there. No wonder--my favorite dogs are huskies! Thanks for sharing this awesome hub! It sure made for an adventurous life for us, cashmere! So glad you enjoyed it. Hey thanks, Enelle. 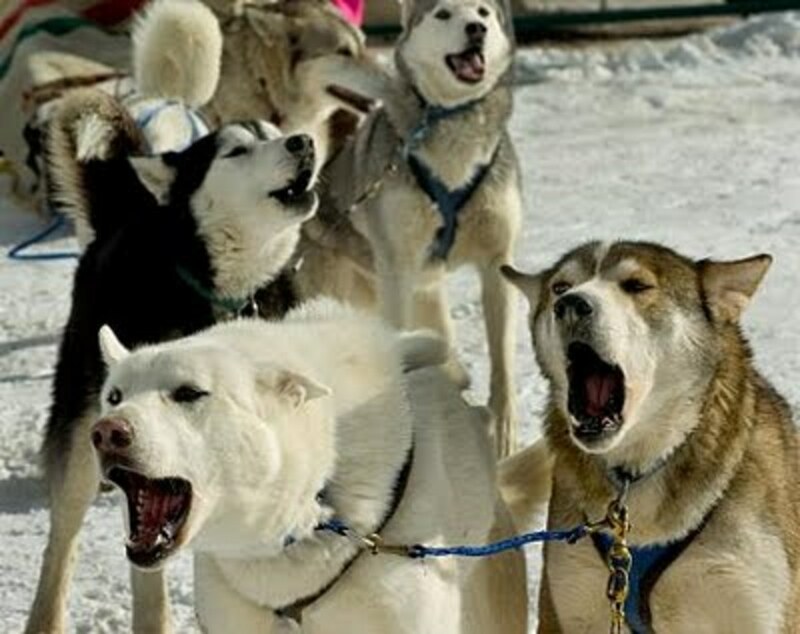 The start of the Yukon Quest reminded me so much of the dogs at the rat camp! High praise indeed! Brings back memories lol...great hub - amazing story, and like travelespresso said "you tell the story so very well." Loved the pictures and the vids...great job! Yes, Alaska is amazing, Paradise7. So is Aklavik and the Eastern Arctic as well. Each is amazingly beautiful in its own way. Thanks so much, travelespresso. Glad you enjoyed it. WOW! What an amazing adventure and you tell the story so very well. Terrific hub. I loved reading about the dog sleds. What a place, Alaska...Maybe someday I'll visit. Your experiences really bring the whole thing to life. Thank you.